ORLANDO, Fla. — Electronic logging devices need to be registered with the federal trucking regulatory agency in order to be valid, an agency official reminded law enforcement officials on Aug. 9. “It’s not an ELD unless it’s listed on our website. That’s going to be part of what you do during an inspection; you’re going to verify that it is a registered ELD,” said Danielle Smith, a transportation specialist with the Federal Motor Carrier Safety Administration’s passenger carrier division. Smith was addressing road safety inspectors at the North American Inspectors Championship, hosted by the Commercial Vehicle Safety Alliance. During her half-hour lecture, Smith reminded inspectors about ELDs’ data transfer procedures via wireless applications, email, Bluetooth devices or USB ports. She also noted carriers have to repair or replace malfunctioning ELDs within eight days of learning about problems with the devices. The agency’s ELD rule takes effect Dec. 18. Its aim is to establish performance and design standards, as well as improve compliance with hours-of-service rules. 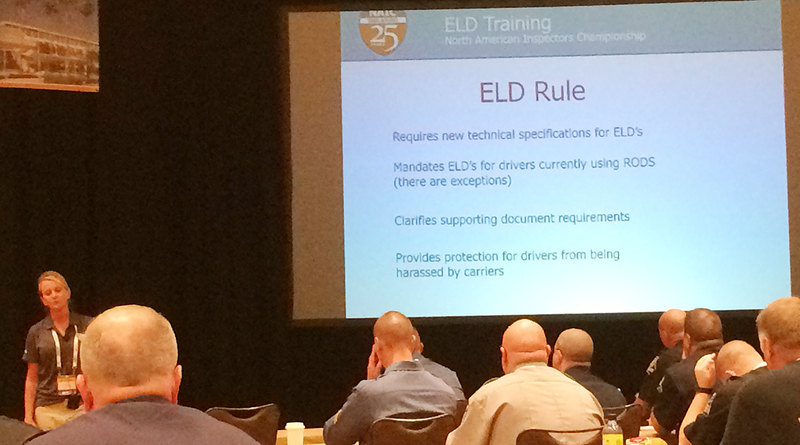 Marc Moncion, head of safety, compliance and regulatory affairs with Fleet Complete, urged drivers to embrace ELDs. His firm’s ELDs are powered by BigRoad.